For many reasons, not the least of which combine technological, psychological, physical and cognitive research and results, the education of students has changed considerably in these first fifteen years of the 21st century. While teachers and administrators know much more clearly that the most effective teaching and learning require a student-centered approach, many schools remain mired in a top-down governance hierarchy where students are measured largely by state requirements and standardized curricula. Educator Peter Senge suggests, “it is exactly innovation for higher-order skills—like critical thinking, self-directed learning, communication and collaboration—that is most needed to prepare students for a world of growing interdependence and change.” The educational landscape is a chaotic one—funding for public education is low, resources are scarce, and innovation is costly. For these reasons and more, many schools rely on an educational system where students are viewed as content consumers rather than the collaborative, creative, problem solvers we expect them to become when they enter a postindustrial workforce. One way to incorporate the establishment of a more innovative approach to teaching and learning lies within the application of systems thinking. This would involve change or improvement efforts based on evaluations of all the interdependent relationships within a given school. Senge writes, in this discipline, people learn to better understand interdependency and change and thereby are able to deal more effectively with the forces that shape the consequences of their actions. Although systems thinking can become a precursor towards real change, a simple shift in thought process of an individual leader doesn’t necessarily translate into school wide problem and crisis resolutions. Ultimately it’s up to everyone participating in the leadership roles of a school to use this approach as a component of a shared vision, in this way reframing their efforts to solve problems by more dynamic means. Every school system is composed of a variety of stakeholders that include administrators, board of directors, teachers, students and parents—each of whom represents a position concerning the state of the school and its potential improvement efforts. Effective leaders involve each of these stakeholders as decision-makers. A key component in designing a change initiative based on systems thinking would be to properly diagnose the system or school in question. According to Heifetz The first step in tackling any adaptive challenge is to get on the balcony so you can see how your organizational system is responding to it. This high level perspective will help provide a more broadly-based view of the challenges at hand, while helping develop a shared vision effectively handling the necessary steps that must be designed and taken. A crucial element to a good diagnosis is the ability to move beyond the application of technical solutions used to fix problems in the past. Heifetz refers to this as A Cycle of Failure where schools simplify problems by applying technical fixes to what are essentially much deeper issues based on more limited models of how learning is shaped as it takes place. Every school is a one large system including a number of subsystems—a leader’s ability to get on the balcony to address adaptive challenges will ultimately reflect his or her ability to move their school from an industrial-age model to that of the 21st century. Schools are dynamic systems involving students, teachers, parents, administration, and political governing bodies. An important element of a school’s systems dynamics is the identification of mental models. Senge identifies mental models as the discipline of reflection and inquiry skills is focused around developing awareness of attitudes and perceptions—your own and those of others around you. Along with systems thinking, this form of recognition helps school leaders get on the balcony to genuinely define the current reality of the school. For most leaders, it is quite natural to focus on where their school excels, avoiding potentially disruptive issues. However, the key to sustainable progress lies within the exploration of obstacles precipitated by negative mental models. If you want to improve a school system, before you change the rules, you must look first to the ways that people think and interact together (Senge). Ian Jukes and Ted McCain suggest that changes in schools are often undermined by the mental model known as TTWADI—That’s The Way We’ve Always Done It (as cited in Scott-Weber). To develop impactful and sustainable change, fundamental shifts are required in the way that people think and interact with one another. “Since the 1982 A Nation At Risk Report, schools have been engaged in instituting changes that will make little difference in increasing student achievement or in graduating more students” (Patterson). Most of the changes we see in schools either do not last, have little impact on student learning, or do not disrupt a model of education dating back to the industrial age. Individual schools and whole districts in general want what can be best for their students in terms of skills and how to effectively “teach” those skills. In following action with idea, schools routinely set goals at the beginning of every year with great purpose and meaning until the unavoidable day-to-day challenges present themselves. Forget the pedagogical dreams of new models of teaching and learning; these cannot happen when daily demands take the time that could belong to innovation. When this occurs, the most effective leaders will review these daily challenges that keep teachers from developing the teaching strategies they know will benefit their students. These leaders will seize this as an opportunity to create change in daily frustrations, replacing them with adaptive solutions created with teachers and other stakeholders. Thus is the process of inquiry and reflection a means to an end for the good of the students. While the ultimate responsibility for student-centered approaches to learning reside in the practice of all teachers, it’s important for school leaders to have the ability to surface assumptions of all stakeholders within that school community if significant change is going to take place. Senge suggests, this process is crucial for people who want to understand their world, or their school, more completely—because like a pane of glass framing and subtly distorting our vision, our mental models determine what we see. Until schools are able to improve mental models and shift thought patterns—status quo within the learning culture will remain with very little opportunity for sustained improvement. Two key skills paramount to the success of working with mental models include reflection and inquiry. The goal of identifying mental models relies heavily on conversations regarding attitudes and thought processes, some of which people are not openly willing to share. For fear of punishment, ignored ideas, and the potential of severed working relationships, educators often withhold their opinions on school practices and student learning. It is up to leaders to provide a safe platform for thoughtful dialogue that clearly welcomes disagreement of all kinds, knowing that out of it will come points of connections, cohesive problem-solving and sequential steps that move groups of connected individuals toward common goals. Far too often, mental models are comprised of misguided beliefs—conclusions are based upon untested observations where people feel that their beliefs are true. 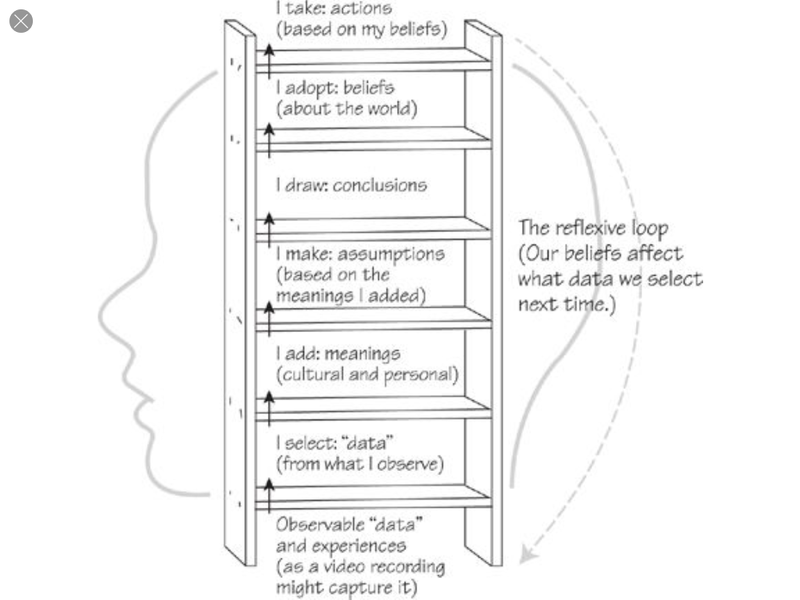 Senge discusses The Ladder of Inference as a reflective loop where people develop misguided beliefs as a result of what they observe as truth from past experience. Many of the most pervasively ineffective challenges in education today are the result of negative mental models. When working with teams of educators, particularly during the reflective process, it is critically important for leaders to prevent the climbing of the ladder of inference. While those with leadership capacity won’t have simple solutions to such adaptive challenges, there is an opportunity to surface the thought process behind the issues, thus working towards effective change. Far too many counterproductive relationships arrive as a result of the untested reflective loop. Effective leaders build collaborative school cultures—leading to collective responsibility, knowledge, and accountability. Michael Fullan suggests that a guiding coalition is critical to the success of school leadership, he writes The leader at the top and the key leaders at the center of the coalition must be in agreement about the core goals and strategy and be able to learn and consistently communicate those goals. A critical component of an effective leader is his or her ability to practice adaptive leadership within the school hierarchy. For example, many schools grapple with improving test scores to reach mandates, rather than offering general enrichment opportunities—adaptive leaders will dive deeply into the problem with teachers and leadership teams to better understand individual student concerns such as social, financial, and cultural issues. Leaders will undoubtedly encounter periods of disturbance amongst the collaborative coalition—teachers, parents, students, and the board directors. Heifetz suggests To practice adaptive leadership, you have to help people navigate through a period of disturbance as they sift through what is essential and what is expendable, ad as they experiment with solutions to the adaptive challenges at hand. The school community often expects leaders to address their problems immediately—leading to a technical solution to an adaptive challenge. While the simpler route may be to apply the technical fix, the adaptive leader honors the process of fully evaluating and understanding the problem, once again leading toward a sustainable solution for student achievement and learning. Adaptive challenges often require a process by which those involved will have to endure a period of distress. While it may not be clear to the school community, this period of discomfort is not the purpose of the adaptive process—it is simply a consequence As an adaptive leader Heifetz suggests You need to be able to do two things: (1) manage yourself in that environment and (2) help people tolerate the discomfort they are experiencing. You need to live into this disequilibrium. This disequilibrium is a repercussion of the difficult challenges schools must endure. As a result, people are asked to step out of their comfort zone—beyond the aforementioned TTWWADI mental model. Heifetz recommends staying within the productive zone of disequilibrium (PZD): enough heat generated by your intervention to gain attention, engagement and forward motion, but not so much that the organization explodes. Conflicts surrounding change initiatives frequently push schools into this disequilibrium—it is the adaptive leaders that embrace such conflicts, realizing that they are a necessary driving force behind change. According to Heifetz & Linsky the ability to cook the conflict is an important skill towards achieving significant change to manage people’s passionate differences in a way that diminishes their destructive potential and constructively harnesses their energy. Two techniques can help you achieve this. First, create a secure place where the conflicts can freely bubble up. Second, control the temperature to ensure that the conflict doesn’t boil over-and burn you in the process. The key to cooking the conflict is the ability to raise the heat surrounding difficult issues enough to get people’s attention and motivate them, while also understanding when to cool the temperature when the conversations become counterproductive. Successful change initiatives in complex educational systems cannot be controlled by one authoritative source. This type of leader-centric approach is doomed to fail—change becomes all about the leader rather than the school as a whole. In a post from earlier this year Leadership: A Day In the Life I wrote, I can’t help but think that the two most important qualities of an effective leader are empathy and the willingness to learn. I stand by that statement—but now realize that leadership is complex, involving a much more collaborative and adaptive approach. The ability to lead adaptively relies on responding to challenges with an approach based on inquiry and reflection. All of the qualities and skills I’ve discussed in my previous essays fall under the umbrella of these two categories—empathy, collaboration, growth mindset, transparency, mental models, evaluation, and systems thinking are all very important components in a process of adaptive leadership that revolves around thoughtful inquiry and purposeful reflection towards action based change. Heifetz, R. A., Grashow, A., & Linsky, M. (2009). The practice of adaptive leadership: Tools and tactics for changing your organization and the world. Boston, MA: Harvard Business Press. Senge, P., Cambron-McCabe, N., Lucas, T., Smith, B., Dutton, J., & Kleiner, A. (2012). Schools that learn: A fifth discipline fieldbook for educators, parents, and everyone who cares about education (First Rev. ed.). New York, NY: Crown Business.